The Singer CG590 Commercial Grade Sewing Machine is being called as a true workhorse by the users. With this sewing product, you could get all the power and features of an industrial product at the convenience of your home. The current sewing device is coming with wide of stitching capabilities and has the capacity to handle each and every kind of fabric. This product is promising you to generate high quality sewing outputs. As the title suggests, this is a superfast machine which would favor you with faster stitching. Read the complete review to know more about this award winning product. With the dimensions of 16 X 7 X 12.5 inches, the current product in review is weighing slightly heavier than some of the computerized models like Brother SE400 combination computerized. The weight of this product is 16 pounds. The Singer CG590 model has been constructed with a heavy duty metal interior frame and hence, you will have a very stable base from which you could work from. The stainless bedplate of this sewing machine would facilitate the smooth fabric feed thereby ensuring even sewing. This commercial sewing machines for sale is being powered by a powerful motor which is 60% stronger than the conventional ones. The machine is highly durable and its durability is further increased by the suction cup machine base. This feature is securing the machine firmly to the table when you are using high speed settings. 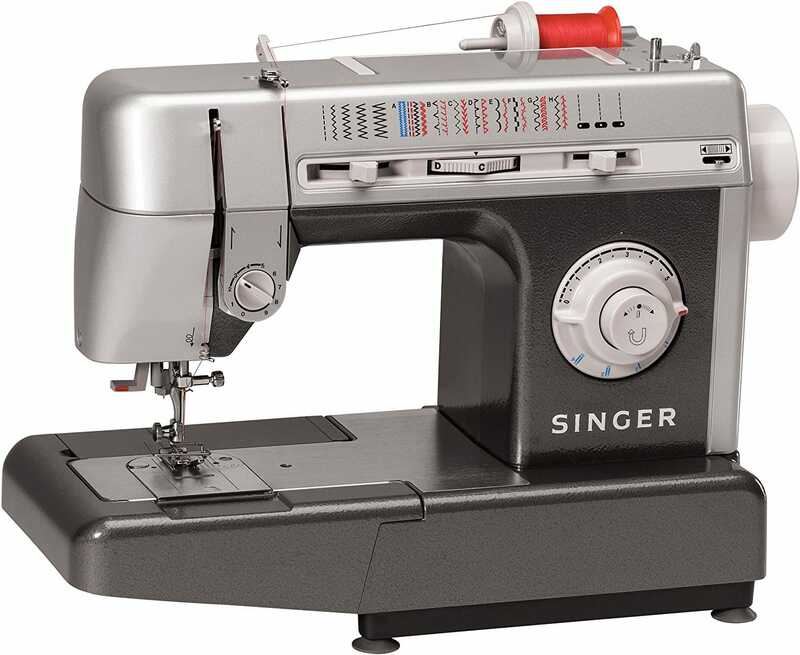 Furthermore, the sewing machine head of this Singer CG590 model is coming with a 25-year limited warranty, 2-year limited warranty on electrical and 90-day warranty over labor from the manufacturer. Threading made Automatic: Thecurrent sewing machine model has been integrated with an automatic needle threader. With this you have to just unlock and place the thread. Then, lock it for getting your task done. This feature is promising to save your time that is spent in threading your needle. Drop Feed Feature: With this particular feature, your free motion quilting to darning processes are made easier than ever. Drop-In Bobbin System: Thebobbin system of the current sewing device is top drop-in type which is jam-resistant too. As per the review articles on sewing machines, this feature will save your time and would allow for an easy drop-in/drop-out bobbin for quicker threading. Buttonhole is also Automated: The Singer CG590 has been incorporated with an automatic four-step buttonhole system which would allow you to make buttonholes automatically in four steps and thus, the process is made easy. Tension can be Adjusted: This is one feature that is loved by all the professional sewers as the tension can be adjusted for ensuring the stable stitch quality. You can be able to change the needle tension as per your special project settings. Reverse Automatically: With the automatic reverse option of this sewing machine, the sewers can now be able to reinforce the stitches and perform reverse stitching much easily. In-Built Stitch Functions: This machine has been in-built with 18 stitches which is including the four-step buttonhole and a free-arm capability. This free-arm feature of the current sewing machine will make the sewing of pant legs, cuffs and other difficult to reach areas easier. In addition to the aforementioned basic features, there are various additional features in the current let go commercial sewing machine model which are responsible to place this product among the top line sewing machine models of present market. Extraordinary Sewing Speed: This is one among the features which is putting this machine into commercial grade. Yes, the Singer CG590 has a speed of 1100 stitches per minute. Three Different Needle Positions: This machine is featuring three needle positions which can be changed according to your projects like cording, topstitching and inserting zippers. Wider Stitch: With this sewing model, the stitches can be set to a maximum width of 5 mm. When you sew decorative stitches, these wider stitches will be bolder and more pronounced. Automated Pressure Control: In this sewing machine, the amount of pressure that is being exerted on the fabric by your presser foot against the feed dog is automatic. Hence, you can sew the lightweight tricots to heavyweight denim without making any pressure adjustment. Touch-N-Wind Bobbin System: This is a trademark feature of Singer which will make the needle bar to disengage automatically while winding your bobbin. Thus, this feature is making the bobbin winding process safer. Feeding System has 7 Segments: The Singer CG590 sewing device is coming with a specially designed feed dog in order to ensure that the fabric is being picked up and supported from the front of your presser foot to the rear. More Features: The current model sewing machine is containing some other special features which are as follows: Adjustable stitch length and width; Extra-high presser foot lifter; Horizontal threading; Box feed; Free-arm with on-board storage; Snap-on presser feet; Thread cutter; Portable and mountable cabinet. You will find it easier to use this sewing machine with the number of automated features like automatic needle threader, automated buttonhole system, automated reverse option and automated pressure control. With all these features, each and every time consuming step in the sewing process has been made simpler and easier. In addition, there are as many as 18 built-in stitches incorporated. Even the beginners can be able to learn quickly by just reading through the operation manual which comes with the stitch guide. Superfast stitching is possible with this machine. There will be no bouncing during heavy duty sewing. This machine is found to work very well with heavy fabrics. The complete set a variety of accessories to aid you in stitching. When you are buying this product from Amazon.com, you can be able to get a huge discount from the original price. The 120-Volt and 15-Watt light bulb of this machine is not so bright. The machine has few plastic parts as well. Singer CG590 Commercial Grade Sewing Machine is definitely a precision-made machine that has been designed to deliver high performance along with consistent quality. This machine is offering you with lots of functionality and is a very good choice for anyone who is seeking for a good quality sewing machine in a lesser price range.